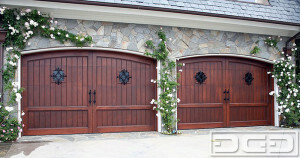 Your garage doors definitely do not need to be boring or utilitarian. Instead, transform your garage doors into an architectural focal point by commissioning custom garage doors in San Francisco CA from Dynamic Garage Door. Carriage style doors are now so popular you can get them in factory designs. However, for the biggest visual impact, you should make your carriage style doors custom garage doors in San Francisco CA. By going the custom route, you can ensure your carriage style doors harmonize perfectly with your home’s architectural style and match all your trims and finishes. At Dynamic Garage Door, we know how to design carriage style doors so that they work with roll-up garage door openers, but look exactly like vintage swing-open doors. In contemporary and mid-century modern homes, the design is often deceptively simple. Without a lot of architectural detail, the quality of your finishes really stands out, and you would never get away with low-end garage doors. Instead, you need quality custom garage doors in San Francisco CA that incorporate visually rich materials like mahogany, copper, glass, etc. At Dynamic Garage Door, we can help you design a door that is perfect for your architecture and your personal style. Of course, when you purchase custom garage doors in San Francisco CA from us we will provide expert installation, including remounting of your opener hardware if needed. However, this is not all we do. We also offer a comprehensive maintenance and repair program designed to keep your doors and opener systems in top working condition and ensure you enjoy your custom garage doors for many, many years to come.